An international project with the aim to connect: Tourism, economy, art and culture. For the students and teachers is the learning objective the development of creativity-do research, and teach the 21st century skills. We changed from a industrial sociaty to a knowledge and information sociaty. All the technology developments have make that there are so much economic and social changes in our socity. It has influence of the lives and work of people. This is the most important power for the 21 centary skills. Education should therefore prepare students for the jobs and skills, learn where needed. Students need to be trained for jobs that do not exist. Also globalization and internationalization brings this need. Learning in the new time ask us to change our way of giving lessons in facilitate learning. It is scientifically proven that it is more effective to ask the right questions and to create the right ambiance for learning. Cipab Zwolle Holland https://www.cibap.nl Cibap is a vocational educational college in The Netherlands with more than 1500 students, studying in the fields of design & media, design & space and design & craftsmanship. The school is well-known in Holland. They have partnerships with schools in Germany, Finland and China. The students are in the final year for creative designer in industry. The last 10 weeks consist of international and national projects. Students then work in companies. It’s called: Cibap in company. The students are 20 years or older and some of these students want to attend the Art academy after this study. Berufscollege Eduard Spranger Hamm Dtsl http://homepage.esb- hamm.de/index.php?id=146 .This is a technical school where students learn to work with wood and metal and machinery. 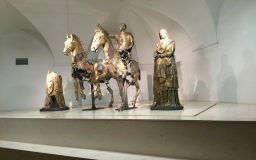 The variety of schools is unique and can raise the quality of art to a higher level. Annette Wessels owner of the Klinker play school for creativity: www.deklinker.nl is the initiator of this project. 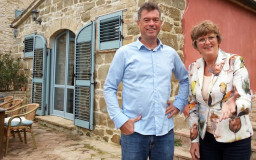 She works together with Wijnand Luttikholt owner of Ca Palazzo: http://www.capalazzo.com/default.htm in Pergola Le Marche Italy. To start the creative process, we’ll begin with the preparation of the workshops in de Klinker in april. The castle is In Frontone, 5 km from Ca palazzo. This is the place where the students make art. Daily busses full of people visited the Castle. This used to be a place for weddings or other celebrations. Since the crisis, there are less activities. The Castle has 13 rooms, toilets and heating. The Mayor of Frontone has offered us to use the Castle so we decided to go to Frontone. This opportunity gives us the possibility for teaching some educative skills, for example: creativity, entrepreneurship and research. Our goal should be to create a business model here from which the economy grows. Hopefully then tourism will flow to Le Marche and both tourism as art and culture will benefit. Frontone is located at the foot of the Catria the highest mountain in the area. They would like to attract more tourism by cyclists, hikers and skiers (there is a small lift). And they would like the economy to grow stronger. The administrator of the Catria and the Mayor are open to our project. We decided on this theme because The Catria, the high mountain will make you feel like heaven and earth are close together. Later on in the process these theme’s will also come together. • Workshops in the de Klinker (Company of Annette Wessels) and in the Academy of Urbino in april. There we will start the creative process and develop a first spatial sketch, the choice for material and technique. Research theme: growing, construction, stacking, hanging, drip and drop. • The students will choose a place around the Catria. And research the following points; tourism, economy, art and culture. • Start Facebook group and introduce students with each other online. • Students who have chosen the same place around the Catria do their sketches together and adjust it with information about the place that they had chosen. • Tour in the Catria to view the place the students have choosen. They will imagine that their sculpture will be placed there as landmark and tourists can use this sculpture to understand what they are watching or viewing. • All these activities will be used as inspiration for the design which is made jointly, even the choice for technique and material. • Every couple of students will get a room in the Castle. There they will start the creative process. • We will even bring a visit to the “Bronzi Dorati in Pergola and the Academy in Urbino. We will visit the city and the museums and be shown around by the students from Urbino. • The exhibition and opening is the last day. • There will also be students joining us that do PR, make photo’s, films and so on. • At the opening there will be many parents, friends and acquaintances and other tourists. • The exhibit will be in summer. Tourists will pick one sculpture they like the most and already connect with the project this way. • In autumn we will choose one of two of the most popular sculptures. Local artisans will than create the definite sculptures at a larger size and under the guidance of the artists/students. • The definite sculptures will be placed along the bicycle/walking route of the Catria, the placement will be also an happening. The lunches and dinners will be provided by the local hospitality industry. We invite the people of the region to participate in the opening of the exhibition for cultural contributions as music, theater etc. It is not just a project, but also a creative process in which opportunities are exploited. Students are helped in a creative process step by step. So they learn the 21st century skills needed to meet the challenges in this exponentially changing time. The teachers of tomorrow don’t only teach on schools, they will teach on public squares, businesses and in churches. Not a one-way street but an exchange of knowledge of students and teachers. Teachers will practice with a new form of education in which they facilitate learning and ask the right questions. It’s not helping but guiding. So education can transform into a new form that fits better in this time, the students and we as teachers learn the skills we need for the future. • Research through the practice of art, by working from a specific artistic discipline, acquire new insights about reality. So not art theory and art history, but art production as research method. • Not only the trade skills and training are important but also biographical skills and general education are essential. • Digitization, how did you make it? This project will contribute to innovation and creativity in the field of culture from all stakeholders. The economy, tourism, art and culture in Italy will get a boost. Annette Wessels Trainer in creativity and Visual artist. Je kunt de projecten volgen op: Movimento Bronzi Dorati door de pagina te liken op facebook.